Five years ago, Delphinus announced it had received 510(k) clearance from the FDA and was able to begin marketing its whole breast ultrasound tomography system in the USA. Then 18 months later, just as a British contender with a similar technology announced its intentions, Delphinus received a further $40 million in venture capital funding. 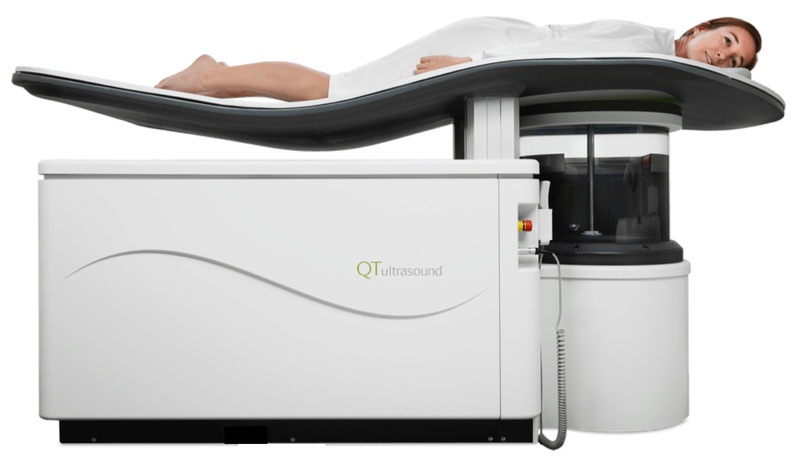 A third company called QT Ultrasound – where QT stands for “quantitative transmission” – has just entered the market. However, there’s an interesting twist: the company not only manufactures the QTscan device, but it also owns and operates three new breast imaging centres in California and Michigan. 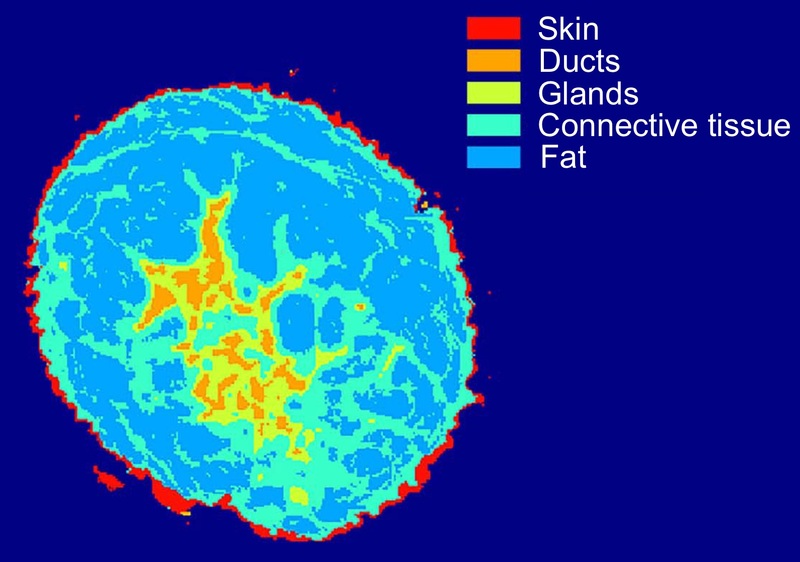 A detailed description of the QTscan was published last year in Medical Physics. Seen at left (© American Association of Physicists in Medicine) is the scan head which performs a full 360-degree rotation around the breast before stepping up to the next level. 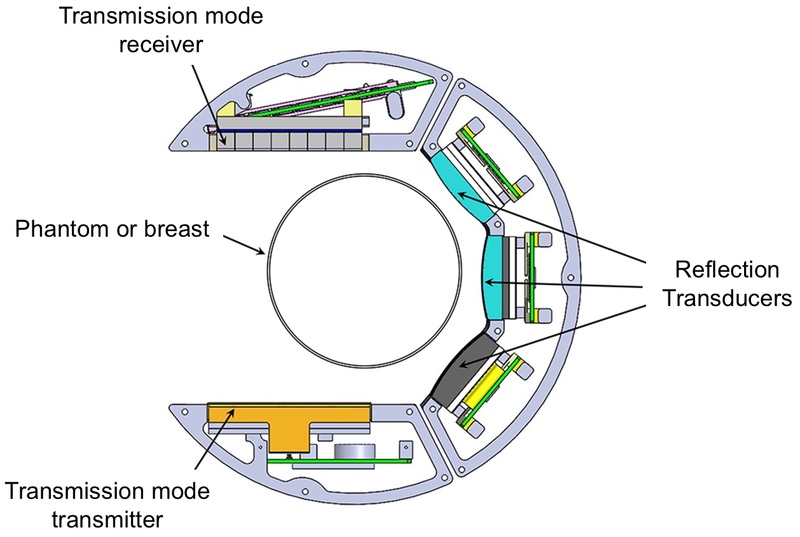 Ultrasound waves are generated by the transmission mode transmitter and enter the breast. Some of the waves pass through the breast and are measured by the transmission mode receiver, while other waves are scattered and measured by the reflection transducers. The QTscan produces three different images based on: speed of sound; attenuation; and reflection. These three images can then be combined with a statistical classifier to yield a colour-coded image that identifies different tissue types (see below right, © Nature). The company, which received a $15 million grant from the NIH in August 2016, has sought to protect its intellectual property with a United States patent application. Translated “It involves two separate tests involving the same comparison problem as is seen today. The mammogram is done with the woman standing (vertical) and the Ultrasound with the woman supine, making it more difficult for the Radiologist to make accurate image comparisons. Anxiety while waiting for the second test results. Why not a combination D3 ABUS Machine capable of finding up to 95% of early curable breast cancers in women with and without dense tissue. A no brainer! It looks like CapeRay is due for the kind of backing QT has without being fully endorsed by FDA! ?